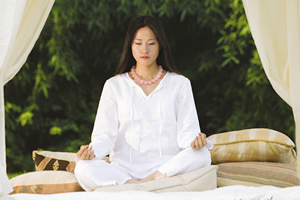 Meditation is known as an effective way to promote relaxation and mental wellbeing. And to maintain good health, we should all make time for meditation. However, research has suggested that if you don’t select the right form to practice, you may not get the results you were expecting. A study at the National University of Singapore, published in the peer-reviewed scientific journal ‘PLOS One’, found that vajrayana and theravada styles of meditation have different influences on human physiology and behaviour. These forms of buddhist meditation are incredibly powerful and those of you who already meditate may choose to try them as you become more advanced. The research has suggested that vajrayana meditation increases focus and attention of the mind by activating the sympathetic system, while practicing theravada leads to a state of relaxation. These are distinctions that mean it’s important to practice the correct form of this art to get the results that you want. Associate professor Maria Kozhevnikov and Dr. Ido Amihai, who were involved in the study, also found that vajrayana meditation enhances cognitive performance. Scientists examined two types of vajrayana meditations and two types of theravada practices. They collected electrocardiographic and electroencephalographic responses among study participants, in addition to measuring the performance of individuals during cognitive tasks. It was found that while theravada meditation created relaxation responses, vajrayana had the opposite effect. Indeed, it activated the sympathetic system and lead to arousal and a dramatic increase in performance during cognitive tasks. The attention capacity of subjects also improved, suggesting that this form of meditation is well suited for when individuals need to be performing at their best. The findings of the study are significant as they scientifically prove that specific styles of meditation are better suited to certain purposes. Of course, this isn’t entirely a new concept and there has been recognition that different forms of meditation create different responses for some time. For example, Qi Gong is used to circulate energy around the body, while mindfulness meditation is more about restoring calm and reducing stress. The latter technique is generally the most popular and commonly used to help people be present in the moment. To try this, take some time in a quiet room to breath deeply and listen to noises around you. Focus on external things opposed to your thoughts. It often helps to close your eyes. This meditation technique is effective at combating anxiety as it centres the brain and stops rumination. However, if you need to energise, selecting another form of meditation may be more appropriate. Nevertheless, if you prefer mindfulness techniques, you can alter it’s effects by introducing essential oils. Using uplifting scents such as citrus can give your mindfulness meditation a more energising effect. A little research into meditation is certainly advised if you want to adopt the best technique for your needs so you can get the most out of the experience.